Last night I received a call from Chris Arnade. He wanted to know where this building was located (Grand Avenue) and how he could learn more about about its founder: Charles J. King. I suggested the Brooklyn Daily Eagle archives and later did a little digging. I didn’t learn anything about the man behind this wonderful building— but I learned who he was not. Without further ado I present for your April Fool’s Day delectation a case of mistaken identity and a slipped mickey courtesy of the December 16, 1900 edition of the Brooklyn Daily Eagle. Enjoy! i like this building. it looks so out of place. That article reads like a page ripped out of Luc Sante’s book Low Life. 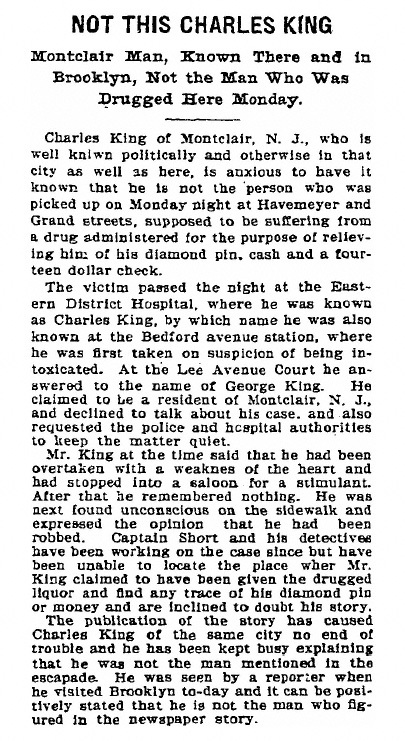 Apparently this kind of drug and rob routine was quite common in New York back in the day. Yeah, I have that one too!